At the time a sheep or other animal is to be slaughtered, it first has inconceivable terror as it is taken from the flock. Blood blisters form wherever it is seized. Then it is flipped upside down, its limbs are bound with cord and its muzzle is tied. The in and out flow of the breath is cut off, and it experiences the terrible suffering of death. If it requires a little time to die, the evil butcher beats it, calling out angrily, ‘This one won’t die!’. … Anyone who can eat such things is a true demon! One would think that the author of this passage (and the many other anti-meat passages in The Words of My Perfect Teacher was probably a vegetarian. And yet, there is no indication in the third Dodrubchen’s Biography of Patrül that Patrül ever adopted vegetarianism (though he is credited with preventing nomads from offering meat to lamas during rituals). Further, I have found nothing in Patrül’s other writing to indicate that he was particularly opposed to meat. The Words of My Perfect Teacher, it seems, stands alone in this regard. Jigmé Gyelwé Nyügu, on the other hand, was a vegetarian (or at least was remembered as one). 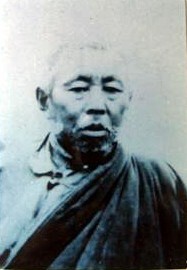 In his own Autobiography, Khenpo Ngakchung claims that Jigmé Gyelwé Nyügu became vegetarian during an early retreat at Mt Tsari, and never touched meat again. Being vegetarian was not unheard of in pre-modern Tibet, but it was not easy and took a certain measure of dedication. Presumably, those who adopted the diet did so out of strong convictions, of the type that could produce an emotionally laden diatribe like the one above. So perhaps we should take Patrül Rinpoché at his word when he claims that The Words of My Perfect Teacher should be attributed to his perfect teacher, rather than to himself. These dates are my own calculation: In his Short Biography of Patrül Rinpoché, Dodrubchen 03, Jigmé Tenpé Nyima writes that Patrül wrote this text while in retreat at Dzokchen monastery. In the next line, Dodrubchen says that Patrül left Dzokchen to see Shabkar, who, unfortunately, died before the two could meet (I would have loved to have been a fly on the wall at that meeting.) Hence, my suggestion that The Words of My Perfect Teacher was written just prior to Shabkar’s death in 1851. If I’m wrong, please let me know! Refers to a popular method of slaughtering where the animal is suffocated by binding a cord around its muzzle. The meat produced by this method, still rich with blood, is said to be particularly tasty. དཔལ་སྤྲུལ་རིན་པོ་ཆེ། ༼ཀུན་བཟན་བླ་མའི་བཞལ་ལུང།༽ in དཔལ་སྤྲུལ་གསུང་འབུམ། དེབ༼ཉ (སི་ཁྲོན:སི་ཁྲོན་དཔེ་ཚོགས་པ། དང་སི་ཁྲོན་མི་རིགས་དཔེ་སྐྲུན་ཁང། 2009) 314-315. See also: Patrül Rinpoché: The Words of My Perfect Teacher Padmakara, trans. (Boston: Shambhala, 1998) 203. I saw an old (pre-1950) print of this photo in Kham recently, with Patrül’s name written underneath, though that certainly does not confirm the photo beyond doubt. According to Rigpa Wiki (where I got this photo) Dilgo Khyentsé Rinpoché thought that it was actually one of Patrül’s incarnations. There can’t have been too many cameras in Kham prior to Patrül’s death in 1887.